While the overall PC market in India declined by 8.4 percent in the first quarter of 2018, Lenovo is optimistic about its continuous growth in the market. The Chinese company, once synonymous with the workhorse ThinkPad laptops, is now banking on ‘ultra-slim’ notebook models to make a further dent in the Indian market. 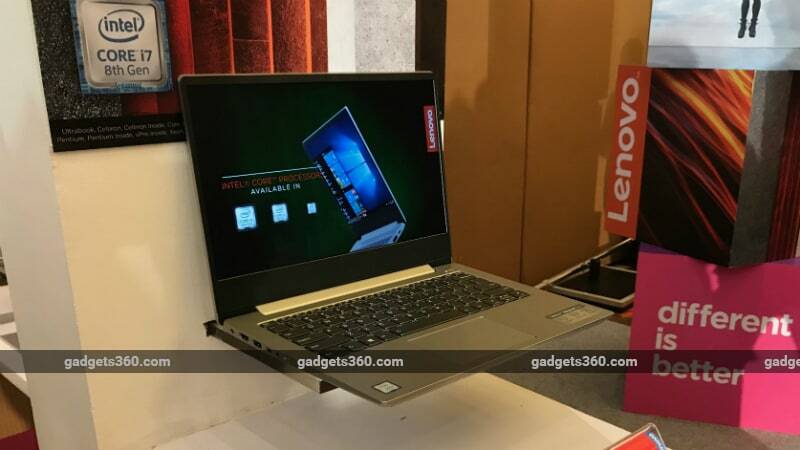 Lenovo recently launched its newest range of ultra-slim notebooks that comprises the Ideapad 330S and Ideapad 530S and the company says it aims to grow by as much as 500 percent in the ultra-slim notebook market this year. To attract customers, Lenovo is using metal finish build that has a slim profile but also comes in a lightweight design. The new notebooks also have premium features such as a fingerprint reader, backlit keyboard, USB Type-C ports, and dedicated graphics as well as SSD options, with a starting price of Rs. 35,990 for the Ideapad 330S. “What we believe is people want to have better-looking products, and we’re now bringing those better-looking products with aluminium finish and better features at an unbeatable price,” says Agarwal. The latest Ideapad-Series is claimed to have up to 50 percent thinner bezels compared to a traditional notebook and deliver almost eight hours of battery life on a single charge. There is also a Rapid Charge support that works similar to the fast charging technology on a smartphone and claims two hours of usage with 15 minutes of charge. Similarly, the notebooks come with an option to include Intel Optane memory module to enhance the performance. “Anybody who wants to buy a better-looking product is a customer for us, but the primary target segment are the youngsters, collage goings, and young professionals,” said Agarwal. Lenovo at the CES 2018 unveiled its ARM architecture-based ‘Always-Connected’ notebooks that are based on the reference designs shared by Microsoft. We asked Agarwal about plans of bringing them to the Indian market. One of the key factors why Lenovo preferred the ultra-slim notebook family against the new Always-Connected models is also the strong demand for PCs based on Intel and AMD processors. In contrast, the Always-Connected models are so far powered by Qualcomm Snapdragon SoCs. The same Snapdragon chips right now power both PCs and smartphones, though Qualcomm recently brought its Snapdragon 850 platform to specifically power the next-generation Windows PCs. “People still have the mindset of buying an Intel or AMD product, so to get a new player, it is not a straightforward march,” said Agarwal. Having said that, Agarwal hints that Lenovo wants to bring its Always-Connected notebook models to India as well. He didn’t divulge any plans, though. “There’s something in the pipeline, you’ll have to wait for it,” the executive teased. IDC’s Manish Yadav highlights that the ultra-slim notebook category in the consumer segment saw a strong 2017 with year-over-year growth of 49 percent. One of the key factors behind the growth, interestingly, is said to be the expansion of the smartphones market. Yadav believes that with the swift change in consumer behaviour, the ultra-slim category will “thrive” over time. “We observe a change in consumer spending as the consumer has now started increasing their wallet share for PC purchase since the devices are becoming more powerful, stylish and has better aesthetics for today’s generations. Hence market for the ultra-slim category will thrive in the coming period,” he added. Agarwal of Lenovo acclaims that his team wants to grow the emerging market of ultra-slim notebooks and eventually dominate the market. “As we’re betting on it, we’re going to create that,” he said. According to the data provided by IDC for the calendar year 2017, Lenovo holds a market share of 18 percent in the consumer notebook category, with 13 percent of growth year-over-year. Agarwal states that while the continuous achievement of obtaining a double-digit growth has made things easier for Lenovo, the company still has a major challenge in terms of how it can penetrate further into the smaller towns. To overcome that challenge, Lenovo recently kicked off its e-commerce operations under the Lenovo.com portal. “For many of our competitors, it’s a link to another site, but for us, now everything is on Lenovo.com,” Agarwal asserts. Nevertheless, Lenovo is strategically selling about 70 percent of its products that are quite high-end through its website. Agarwal says that these are the products that normally retailers are not willing to stock. In this way, the company is able to grab some eyeballs through its online presence as well. The executive also reveals that his team is also doubling up the marketing budget to bring more traffic and improve the existing site experience. “We expect more and more traffic, and with the better site experience, we also experience better conversion. We just launched the seamless site about a month ago. In the next few weeks is when we’ll see the benefit,” he continues. Alongside pushing its e-commerce operations, Lenovo is set to improve its after sales in India to take on the competition. Agarwal notes that the company is already promoting its consumers to complain on the official Lenovo Twitter handle, and every single complaint gets addressed in 30 minutes. He also reveals that there are plans to bring a WhatsApp-based support chat using the lately arrived WhatsApp Business platform. “One of the options will be that the consumers will have a WhatsApp chat directly with our technicians,” the executive tells Gadgets 360.